Customize the look of your new leg table by first choosing your wood selection. This beautiful table can be handcrafted in solid oak, cherry, maple or walnut wood. You then choose from a wide variety of finish options. 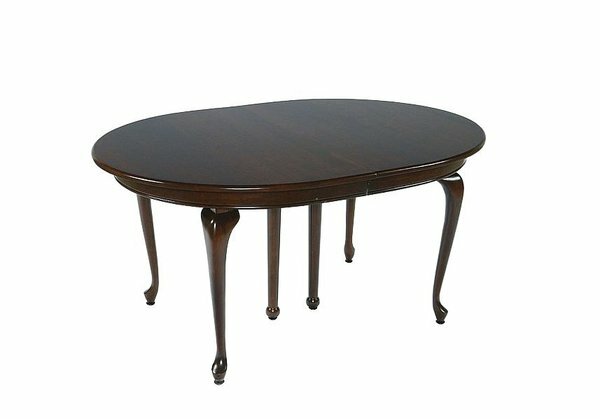 This table is available in 6 table sizes from a 42 by 60 to a 48 by 72. This can be a solid top table without extensions or you can choose to order this as an extension table. Each extension is 12" wide and none of them self store inside this table. You can add anywhere from three to fourteen extensions which could expand the table an additional fourteen feet or 168". If you are looking for a table that can really enlarge to seat the whole family then this is the perfect choice! The table legs are inserted into the table with a mortise and tenon joint for extreme sturdiness and strength. They have levelers for a balanced setting on even the most uneven floor. The table apron is steam bent for a smooth fit. There is a slight gap in the apron where the extensions fit to allow room for the natural contraction and expansion of solid wood. Please note that this table does not come with additional legs as shown above, unless many extensions are used.